Clothes with the Bellville Sassoon label were noted for their fashionable cut, bright colour palette and youthful aura. This embroidered organdie evening dress was further embellished with pendant beads and sequins in Bellville Sassoon's workrooms. Jill Ritblat wore this dress for formal evening occasions. 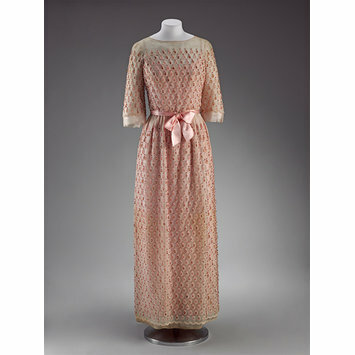 Pink embroidered organdie dress with silk ribbon bow. Worn and given by Jill Ritblat. 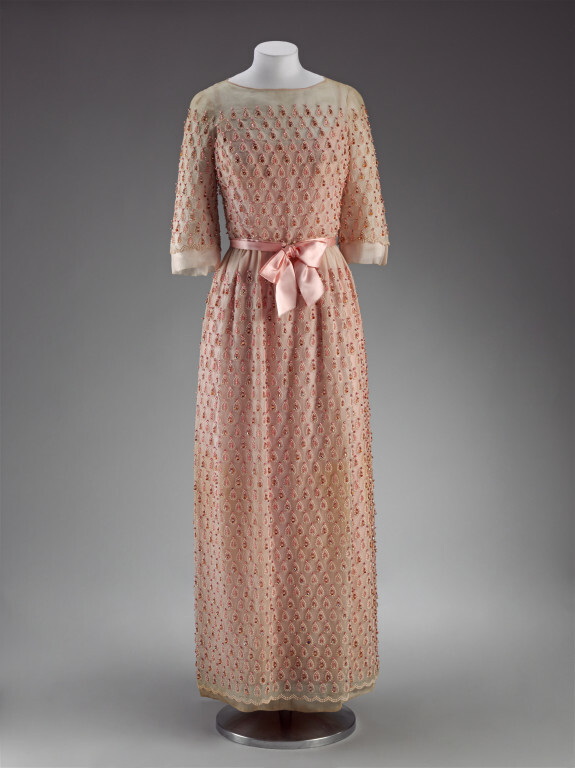 Evening dress of pink embroidered organdie with silk ribbon bow, Bellville Sasson, Great Britain, 1964.
de la Haye, Amy, ed. The Cutting Edge: 50 Years of British Fashion 1947-1997. V&A Publications, London, 1997, p. 79.